Jake Atlas and his family are on the run, hunted by international police while chasing the mysterious People of the Snake to stop them from hiding the secret history of humankind. But when the family's friend, Sami, is poisoned, the People of the Snake force the Atlases to work for them in exchange for a cure. Their mission: to locate a legendary lost city and the tomb of the Aztec god Quetzalcoatl in the jungles of Honduras – home to bandits, big cats, tarantulas and crocodiles. But the family's greatest enemy is themselves, as their squabbles threaten to get them into even deeper trouble. In order to reach the tomb, the family must survive ancient traps, jump out of a crashing plane, escape a jaguar's lair, climb a cliff of skulls, jump over a huge waterfall and escape from a trap of swinging blades! 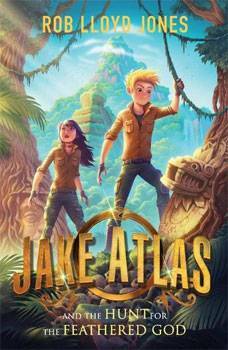 A brilliant heart-thumping sequel to the increasingly popular Jake Atlas and the Tomb of the Emerald Snake, this is another high-octane adventure, full of laughs and high-tech gadgets, from an award-winning author. Rob Lloyd Jones never wanted to be a writer when he grew up – he wanted to be Indiana Jones. So he studied Egyptology and archaeology and went on trips to faraway places. But all he found were interesting stories, so he decided to write them down. Jake Atlas and the Hunt for the Feathered God is Rob's fourth novel, though he has written more than thirty other books for children, including non-fiction and adaptations of such classics as Jekyll and Hyde. He lives in East Sussex with his wife and two young sons.